Audrey and Daniels dad is driving them to their new life, to live with a grandmother they barely know. Since the death of their mother, none of them are the same. Audrey's dad is barely a dad anymore, and Daniel looks to Audrey as a replacement for their mom. Audrey doesn't know who she is anymore, without her mom and with their lives falling apart. During the endless, awkward drive Audrey falls asleep in the car, listening to an old song on the CD player, and wakes up as their dad turns onto an old, grown up drive. Her and her brother are both confused, but then the woods open up and there is the most beautiful set of iron gates. And then... there is the Ruby. Their dad decides they need to rest for the night, and sees the sign for Hotel Ruby. Once inside, things start happening quickly, everyone starts changing, and Audrey is left to figure out the truth about the Ruby, with the help of some very curious staffers and a handsome boy named Elias, the reason for the nightly party. 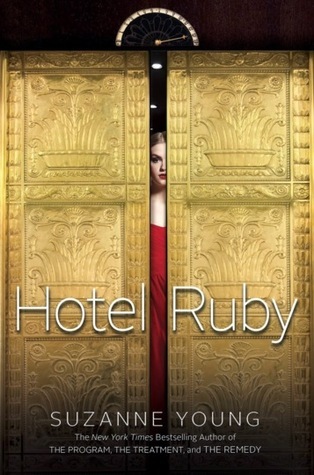 I was immediately intrigued by Hotel Ruby, and I desperately hoped it would live up to the huge expectations in my head. It may not have lived up to every single one of them, but I loved every stinkin minute of it anyway! Full of creepy vibes, and creepier characters and a mystery that you just can't quite figure out, Hotel Ruby more than made my day. I am seriously sad that the ending came, and this one time I wish I had a sequel to look forward to! Audrey, Daniel, Elias.... each and every character in Hotel Ruby had a very distinct, individual voice. I loved Audrey. She was strong and determined, and unendingly loyal to her family and new friends, and to Elias. I loved all of the different relationships that were built in the story. Even though the relationship between Audrey and Elias could definitely be classified as inst-lust, I still really enjoyed them together. Their were relationships filled with animosity, hesitant friendship.... And they made this story even better! Hotel Ruby was paced perfectly, the writing was wonderful. And the mystery was like one of those words or answers that is right on the tip of your tongue but you can't quite get there... I loved it! The only thing I feel like was missing was some seriously scary parts, but the story didn't suffer because of it. I still enjoyed every second of it. Please, Suzanne Young, give us another creepy tale... I will be first in line, waiting to read it. Hotel Ruby is perfect for this time of year, when the weather is getting cooler and Halloween is right around the corner. If you are a fan of creepy and strange, this is definitely the story for you. Thanks to Around the World ARC Tours for sending me a copy to review! Oooooooo.....I love the sound of this one! I just added it to my TBR. Thanks for the recommendation!